And just like that another year has come and gone! Who'd have thought 2017 would be as...crazy as it was? Let's focus on all of the good things from this year and get pumped for 2018. Now if you've been a reader of Keep Calm and Chiffon for a while, you may know that I'm not the biggest fan of New Year's Eve. I love the thought of getting dressed up and going dancing, of popping champagne and toasting to being better versions of ourselves than we were the year before, but my biggest problem with new years is that there are such high expectations. People make grandiose resolutions instead of setting smaller, manageable goals, and every year when friends invite me out, I always fantasize about staying in and sipping on bubbly. But, lucky for you all, I have been persuaded to go out this year. And you get a little sneak preview of my outfit (make sure you're following me on Instagram to see photos from the big night), I thought I'd daydream a little about some fun makeup ideas. I usually do some variation of the same old makeup so I think that NYE is the perfect time to try out something experimental and definitely glittery like I did here. Sometimes a glittery eye is all you need! I picked out two palettes below that I think are perfect for NYE. This one by Pat McGrath has so many beautiful shimmery shades, while the Anastasia Beverly Hills Modern Renaissance palette also offers some shimmery shades but in a burgundy color scheme. 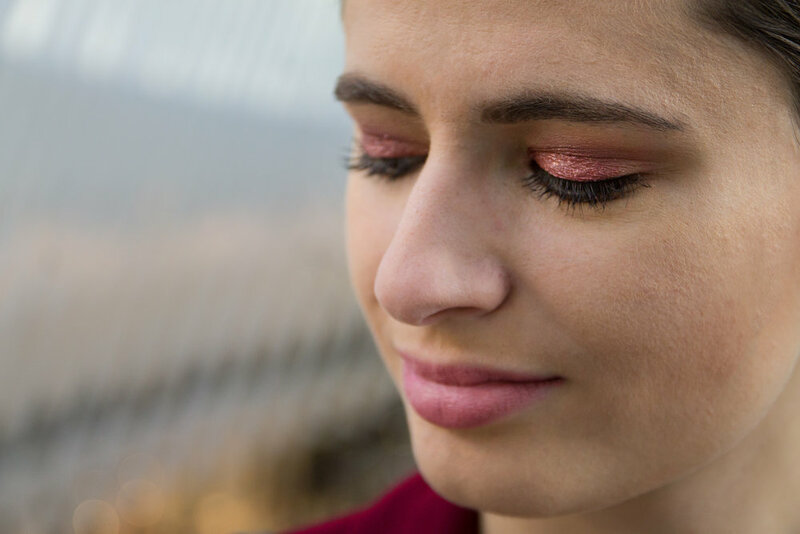 If you're looking for single shades, Stila's Shimmer & Glow liquid eyeshadow is highly pigmented and super long-lasting (and I'm wearing it in these photos in the shade In a Firenze) while Urban Decay's Moondust eyeshadow offers a more subtle shine. If you love to make a statement, then glittery lips might be exactly what you're looking for. Bite Beauty's prismatic gloss is a great way to add dimension and shine to your look. Stila makes a lip gloss and with a name like Glitterati your midnight kiss won't be able to resist. And the queens of makeup also have some amazing options: Pat McGrath's LiquiLust lip kits not only come coated in glitter but the products will up your lip game, while Rihanna's Fenty Beauty Hyper-Glitz lipstick will keep you sparkly until the last bottle of bubbly is popped. There's nothing like a subtle (or not-so-subtle) shimmer on a collarbone, cheek, or even your shoulders! If you're looking for smooth and shimmery, Milk Makeup's Glitter Stick is all you need. I'll be wearing my favorite highlighter (watch my full product review video over on my YouTube channel) Becca Cosmetics Prosecco Pop when the clock strikes midnight. If you want the glitter to go beyond your face, Sephora's Ultra-Fine face and body glitter and Make Up For Ever's glitter products will be sure to keep you sparkly everywhere. The easiest and best way to get glittery for NYE is by painting your nails! Go for a more subtle sheen with the Nails Inc. Dirty Unicorns Collection or feel super luxe with Christian Louboutin's shimmery polish. If you want a confetti-like effect, Deborah Lippmann's got you covered with this bright and festive glitter polish. Will you be rocking glitter this NYE? What are your plans?